We hope you had a FANG-tastic Halloween and are looking forward to all the holidays coming up that will bring your family and friends together around the table to celebrate and enjoy each other’s company. We are already in full Thanksgiving mode here at FamousFoods and this week we wanted to highlight on of our favorite and most versatile items: Heritage Mik Lunch Crackers. Not only are they perfect for your breakfast or mid-day snack, Milk Crackers are used in one of our favorite stuffing recipes. We are currently running the lowest price of the year on our Milk Crackers as well: Pick up 6 or more boxes for just $3.49 each. In a food processor, grind the milk crackers into crumbs. Place in a large bowl. Place sausage in a large, deep skillet. Cook over medium high heat until evenly brown. Drain, reserving liquid, and mix into the bowl with cracker crumbs. In a medium saucepan over medium heat, slowly cook and stir the onion and celery in 3 tablespoons of the reserved sausage liquid until soft. Mix the onion and celery into the cracker crumb and sausage mixture. Mix in the poultry seasoning, salt, pepper, eggs and milk. Chill in the refrigerator approximately 1 hour before stuffing the turkey. You can find a printable version here. For more of our traditional New England favorites for Thanksgiving, you can read last week’s blog that highlights all the things you need to stock up on before the big day. Daylight Savings is happening Sunday, March 12 and yes that means we lose an hour of sleep. On the bright side it also means spring is on its way. To help you prepare for your unavoidable sleepy mornings we suggest you make a delicious Portuguese breakfast sandwich using the finest chourico patties from Amaral’s! It’s simple and delicious. First fry the chourico on both sides and remove from heat. Then lower the heat and fry up an egg to your liking using salt and pepper for taste. 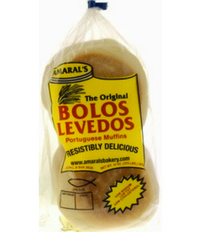 While that is cooking pop an Amaral’s Bolos Levedos Portuguese Muffin in the toaster. If you’d like add cheese to your egg. Once the muffin is heated build your breakfast sandwich with the chourico patty and egg! Some people like dipping it in hot sauce or ketchup. Either way your Portuguese breakfast sandwich will make your mornings much better! Don’t forget use Coupon Code SAVE10 and save 10% off your entire order! This code is valid March 4-10, 2017. Sink your teeth into the freshest, most mouth-watering muffins you’ve ever had. Toast them up or eat them straight out of the bag; you’ll love them either way! As stated above, Bolos Levedos are great for breakfast sandwiches! 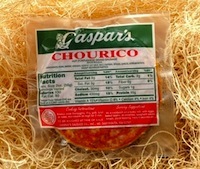 Gaspar’s Chourico Slices 1 lb. Chourico has a kick of spice to it! Perfect on your breakfast sandwich or on the grill! Amaral’s Easter Sweetbreads have made their seasonal return! For over fifty years Amaral’s Bakery has baked Portuguese favorites for all of New England. Their sweetbread is their most popular bakery item. Amaral’s perfected sweetbread recipe creates a sweet perfectly golden outer layer and soft delicious center. Portuguese Mini Easter Sweetbreads come in a package of 6. Each miniature loaf comes with one hard boiled egg. Our local Portuguese residents also refer to this as “folar” and request it every spring! 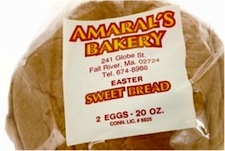 Portuguese Easter Sweetbread with 2 Eggs from Amaral’s Bakery is a hometown favorite which many purchase for Easter. The hard boiled eggs are cooked into the bread and are said to symbolize rebirth. The large Portuguese Sweetbread with 4 Hard Boiled Eggs will be available starting mid-March. Our full selection of Amaral’s Bakery includes Portuguese Sweetbread rolls, Bolos Levedos Portuguese Muffins, Portuguese Tea Biscuits, and of course traditional sweetbreads. We hope you take our advice and whip up a delicious Portuguese breakfast sandwich! In a small sauce pan add your can of chopped tomatoes, sugar and vinegar. Simmer for almost an hour or until the liquid thickens. (this is your sparkle) Add your 2 cans of beans to a large sauce pan and add your thickened tomato sauce, ham, chopped peppers, and corn. Simmer for 30 minutes. Great for pot lucks or a family meal! Recipe by Ruth W. of Arizona. 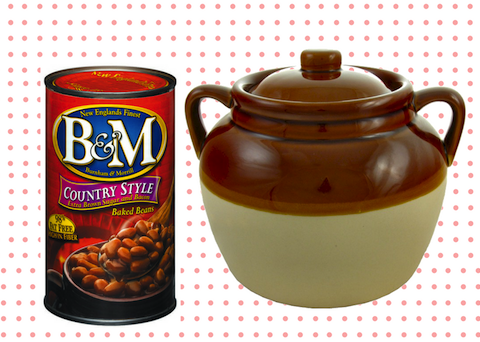 Shop FamousFoods.com’s entire selection of B&M Baked Beans and Brown Breads! Greetings Cooking Fans & Foodies. Need a delivery of Thanksgiving ingredient to arrive before the big feast? We suggest you get your order in now to take advantage of ground shipping. Next week will likely be too late depending on your area of the country. If in doubt be sure to check out our Thanksgiving shipping guidelines. Need extra incentive? Our top Thanksgiving items are ALL ON SALE RIGHT NOW! And if you spend $50 or more you can even save an additional $5 on top of that. Simply enter the coupon code STUFFING at checkout and instantly save $5 on orders of $50 or more. 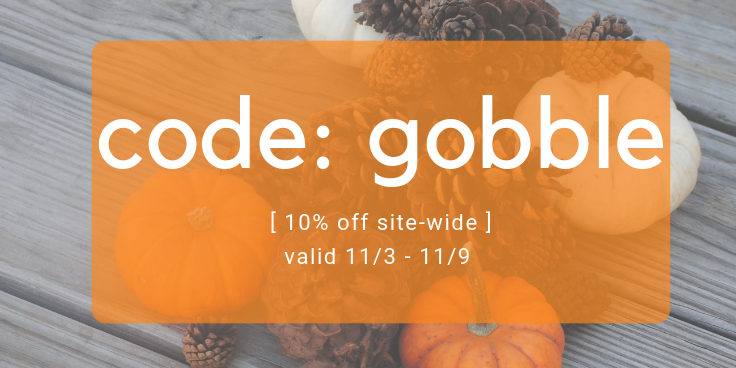 Coupon code valid from November 14-20, 2015. Looking for a list of our top sale items this week? We’ve got all of the Thanksgiving essentials! Heritage Mills Lunch Milk Crackers Case of 12 for $39.96 (GREAT DEAL!) Also available for purchase by the box! Bell’s Seasoning now only $2.99 per box for 3 or more! Bell’s Ready-Mixed Stuffing (original) now only $4.49 per box for 3 or more! Bell’s New England Style Stuffing w/ Cranberries! Also only $4.49 per box for 3 or more! Bell’s Chicken Flavored Stuffing $2.99 for 3 or more boxes! Cuisipro Roast & Serve Rack – Check it out, its ingenious! – now only $17.99! One Pie Pumpkin or Squash now $3.49 per can for 3 or more – The only way to make Thanksgiving pies! Cranberry Bog Frogs $8.99 this week! Grill Friends – Turkey Brining Bag $7.95 – 20%Off! See more great prices on Thanksgiving Essentials! 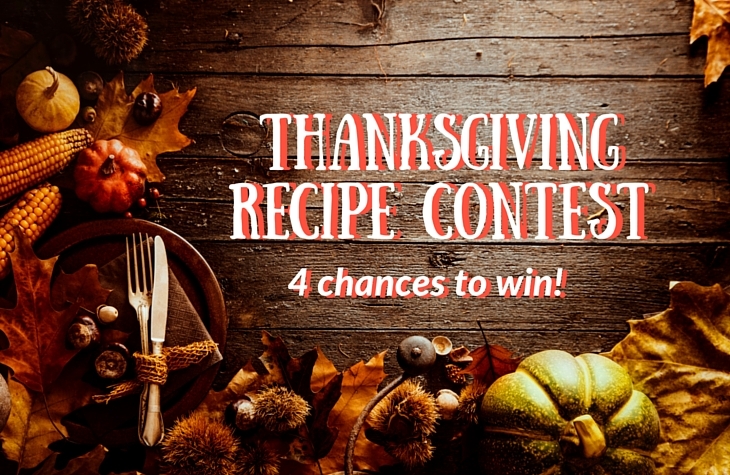 We were so thrilled about how many of our fans participated in our Halloween Riddles Contest that we’ve decided to host a Thanksgiving Recipe Contest! The rules are simple. 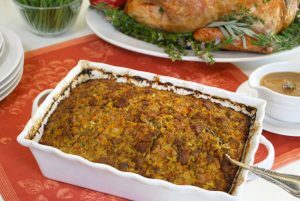 Email or Facebook message FamousFoods.com a Thanksgiving recipe using one of our products or a product you wished we’d carry and be eligible to win a shipment of New England foods! Each week a winner will be chosen. The winning recipes will be featured on our blog, newsletter, and Facebook page! If you’re searching for a New England tradition to continue, look no further than One-Pie Pumpkin. Need to know how to make a pumpkin pie? 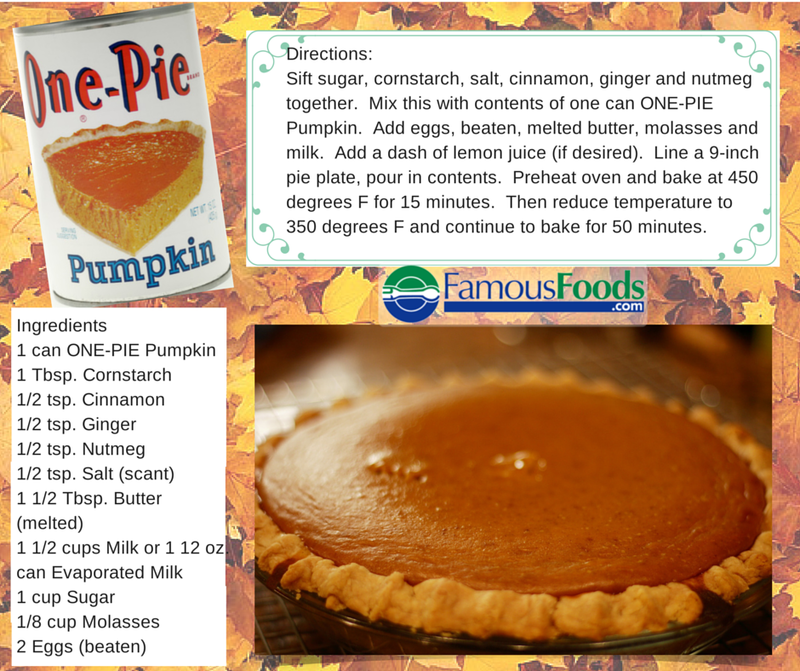 Look below for the One-Pie New England Pumpkin Pie Recipe! This nostalgic brand has not changed in years, you can tell just by looking at One-Pie’s label. The recognizable canned pumpkin is an admired Thanksgiving dessert recipe. Generations of New Englanders have kept this as their main ingredient in their own holiday pies. There’s only one ingredient to this deliciousness and that’s prepared pumpkin! There is no need to worry about added calories or salt content since One-Pie only uses pure pumpkin. Sift sugar, cornstarch, salt, cinnamon, ginger and nutmeg together. Mix this with contents of one can ONE-PIE Pumpkin. Add eggs, beaten, melted butter, molasses and milk. Add a dash of lemon juice (if desired). Line a 9-inch pie plate, pour in contents. Preheat oven and bake at 450 degrees F for 15 minutes. Then reduce temperature to 350 degrees F and continue to bake for 50 minutes. Preparing a Cinco de Mayo menu? Don’t forget the margarita mix, salt, and lime! We’ve put together 3 recipes for you to try! 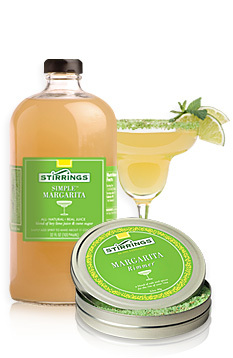 Stirrings Simple Margarita Mix makes crafting the perfect drinks easy and delicious. Their mouth-watering recipes will be the highlight of your Cinco de Mayo menu. Make sure to order your Stirrings products in time for May! Combine 4 oz. of Stirrings Simple Margarita Cocktail Mixer with 3 oz. of tequila. Mix in a blender with a large amount of ice until cocktails are blended (about 25 seconds). Use Stirrings Margarita Rimmer to coat the glass with salt, pour, and drink in the south-of-the border flavors. Bar-Tender’s Instant Margarita Mix is a simple yet delicious way to shake up your Cinco de Mayo menu. The recipe is easy as 1, 2, 3! 2. 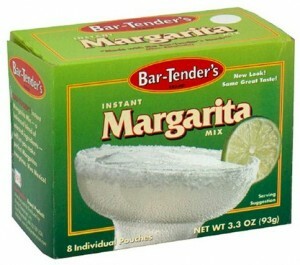 Pour in the contents of 1 pouch of Bar-Tender’s Instant Margarita Mix and shake well with ice. 3. Strain into a 5 oz. cocktail glass which you have prepared by “salting the rim” (moisten rim & dip in salt). Pour ingredients in shaker with ice. Shake until well-blended and serve in salted rimmed glass. 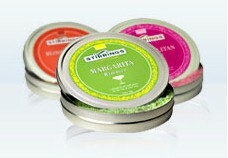 For a sweet-tart margarita choose Stirrings Pomegranate Martini Mixer in place of the Watermelon Mix. When we think of Cinco de Mayo food our first thought is most likely “tacos” but have you ever heard of Pigs in Ponchos? We hadn’t either until we stumbled upon a recipe from Rachel Ray on our Pinterest. Pigs in Ponchos are hot dogs wrapped in flour tortillas that are coated with mustard, salsa verde, refried beans, and cheese! For the “pig” part of this recipe try Kayem Deli Hot Dogs or their other varieties. 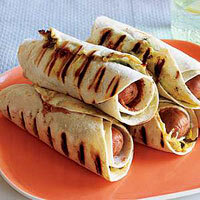 The hot dogs are parbroiled and wrapped up before grilled. Full recipe can be found at www.rachaelraymag.com. To help you get ready for your fiesta FamousFoods.com has created a coupon code for 4/24/15 – 5/1/15 so you can receive your order in time for Cinco de Mayo. 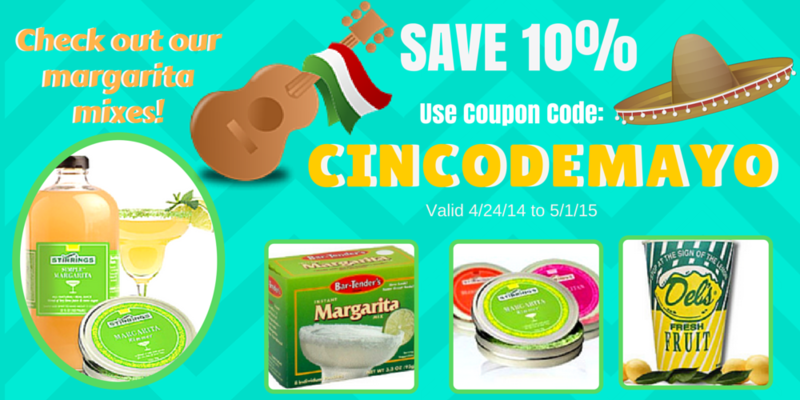 Enjoy 10% off your order when you use the Coupon Code: CINCODEMEMAYO at check-out. 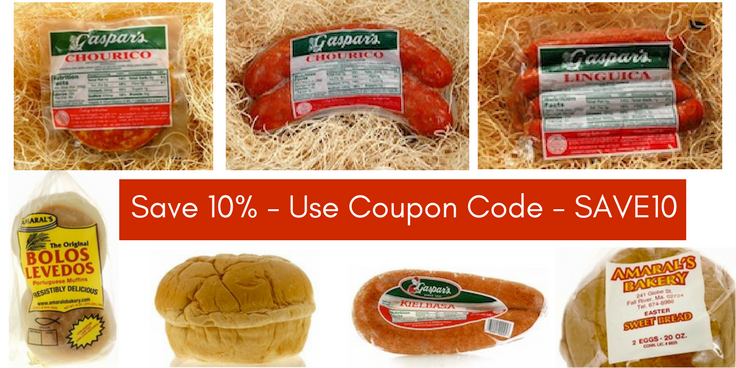 REMINDER: Tuesday April 28th is the last day to check 3-day shipping on products from Gaspar’s Linguica and Chourico. After that it will be switched to 2-day shipping. This helps assure us that your order of meats will arrive in good standing. Orders that are going to states that will be experiencing warmer weather should order by April 28th to receive the most cost effective pricing. Introducing Stirrings 5 Calorie Cocktail Mixes!